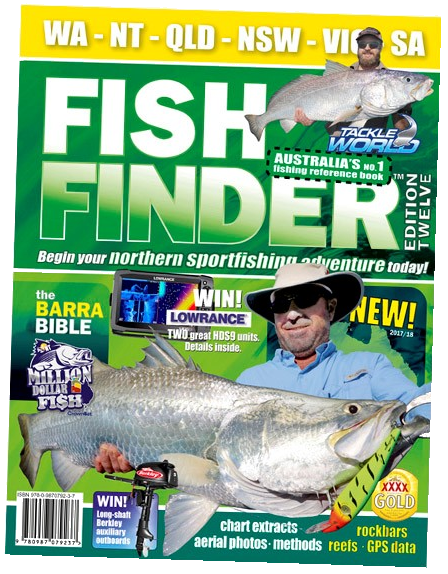 FISH FINDER 12 is the latest edition of Australia’s fishing ‘bible’, released for 2017/18. This book is essential kit if you are chasing the NT’s Million Dollar Fish (MDF), as it contains the most detailed Northern Territory fishing maps available anywhere. MDF will run again in the 2017/18 wet season, with dozens of $10,000 tagged barramundi to be caught in NT waters. The FISH FINDER TM book famously tells you where rockbars, wrecks, reefs, holes are, and many of the best fishing spots. The 2017/18 edition covers all mainland states, but with the greatest detail is in Australia’s remote north, especially Darwin and the Top End, Cape York Peninsula, and the Kimberley. There’s advice on choosing gear, including specialist barramundi boats and tackle.